Can Mosul's Christians ever Go Home to their Historic Neighborhoods? They have been harassed, threatened, have lost all their worldly goods and forced to flee. What, if anything, would make Mosul’s Christians want to return to the city they used to call home? A celebration at an Orthodox church in Mosul in the early 20th Century: Syriac Christians lived in Mosul for centuries before extremists drove them out last year. It is almost certain that, as a senior Christian cleric in Iraq, Patriarch Louis Sako, put it in an interview with news agency, AFP, “for the first time in the history of Iraq, Mosul is now empty of Christians”. But what, if anything, would make Mosul’s Christians want to return to the city they used to call home? Iraqi Christians have lived in Mosul for thousands of years. However after the 2003 US-led invasion of Iraq, numbers dwindled as they sought safety elsewhere. Maan Basim Ajaj, a former advisor on Christian and minority affairs to the governor of Ninawa, of which Mosul is the capital, estimates that before 2003, there were around 525,000 Christians in the province. About 125,000 lived in Mosul with the other 400,000 living around Ninawa. However after 2003, numbers decreased rapidly and by last year, only about 8,000 remained in Mosul with only around 125,000 staying elsewhere in the province, Ajaj estimates. After the extremist group known as the Islamic State took over Mosul and its surrounds, almost all Christians fled, faced with no realistic alternatives for life there. Now if you ask those who fled under what conditions they might return – if ever – you tend to get the same answers from everyone. The first condition is that there must be international protection for anybody returning. And the second is that the Christians be allowed to create their own semi-independent administrative entity. In a March 2015 speech given to the United Nations Security Council, Sako asked that Christians and other minorities in the area be given international protection. Additionally he asked that the minorities be given a special protected area for themselves on the Ninawa Plain, an area where Christians, Yazidis and Shabak minorities have traditionally lived. And finally he asked that Christians be financially compensated for the property they had lost, so that if they did return to Mosul, they could take up their lives again without any hardship. Hadaya believes that there is a future for Iraq’s Christians here. Those grim opinions are shared by many. There’s no trust anymore, says Abdallah Elia, a writer and poet in Erbil. “Iraq’s Christians have become aware that there are parties inside and outside Iraq who are trying to empty the country of Christians. And it seems those efforts are succeeding,” Elia notes. Speaking to Christians who are now living in the relative safety of the semi-autonomous region of Iraqi Kurdistan, protected by the Iraqi Kurdish military, it seems they are all trying to make up their minds between some difficult choices. Some feel that they have strong bonds with their old homes in Ninawa, they consider it their ancestral homeland, and they want to preserve this important link by returning one day. Others are only looking westwards, citing their desire to protect the next generation and hoping to be able to immigrate to a safer country. 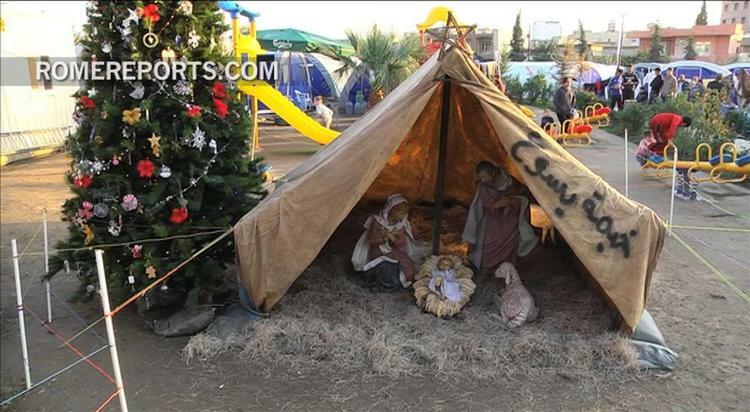 One thing is certain: Iraq’s Christians are confused and demoralised. They are emotionally attached to their land but they also know it will be very dangerous to return to it.